My wife and I had our son 11 years ago. With a new born, I thought my hiking days would have to be put on hold for several years. Then I took a good long look at my list of Cape Breton Trails and realized many of them are perfect for kids as long as you choose them wisely and set the ground rules and expectations early. First of all, you have to realize, they are kids. They don't want to go for a hike to connect with their inner self or get away from the hassles of work. THEY WANT ADVENTURE! You also have to realize, the great outdoors is filled with adventure. If there are dangers on a trail, identify them early and stick to your guns. "Stay away from the water means stay away". Keep the distances short. This being said, kids don't get tired they get bored. Remember your liquids (water, sunscreen, bug spray) for the kids because they won't. Give your child their own little pack to carry their water and anything they find along the way. Google the name and a small fact about three plants, trees, or animal tracks you will encounter before you go. Your kids will think you are Les Stroud from "Survivorman". Play games along the way. I have a great list on moosebait.com. Bring a friend for your child. Their friend will love it too. Alright, now for the list you have all been waiting for. I have also included links to each trails details and directions. Uisge Ban Falls (Baddeck): This is an amazing woodland trail (about 6km return) leads to a wonderful two tiered waterfall. The thing that makes this trail great for kids is the amount of boulders and twisted trees along the way. Kids love exploring these, running up and down, poking their heads through tree roots, and hopping from rock to rock. Simon's Point (Louisbourg): This 2km trail takes you through a bog, woodland, and deposits you on the shore where you and your kids can beachcomb for hidden treasure. Make sure you let them know that this is the rout the British drug cannons along when they invaded the Fortress and get them to pretend they are in the advancing armies. The Bog (Cabot Trail): This trail is a magical 0.5km trail perfect for introducing your child to carnivorous plants, swamp creatures, and a trail that is littered with interpretive signs pointing out all kinds of facts. Make sure you drill into them that going off the path will result in an unpleasant swim. Lone Shieling (Cabot Trail): What kid wouldn't love exploring a stone house which looks like it belongs in Middle Earth. That, along with a 0.6km trail which passes by a stream perfect for racing leaves. Lighthouse Trail (Louisbourg): If you have one of those kids who hate flies, this is the trail for you. Head out on a brisk breezy day and enjoy a 3km walk, crashing waves, and a fly free day. All but one of these trails is a loop or partial loop trail which makes the hike go faster and keeps your child interested longer as they always have new things to explore. For more kid friendly outings, games to play on the trails, and other hiking resources, visit moosebait.com. Posted by Steven Rolls on goCapeBreton.com where you can find and share everything about your local community. So when does the MooseBait mobile app come out? Something to easily filter trails by length, ease of trail/access. Etc? And maybe a way to launch into google maps for directions to the location? When are you free to help me build it. How about at the next hackathon? The Lone Shielding Trail is one of Cape Breton's overlooked gems: an easy walk through a spectacular old growth forest. My son is 11 and he comes with us on every adventure. We've only had one bad trail experience. That was due to horrendous mosquitos and not the trail itself. 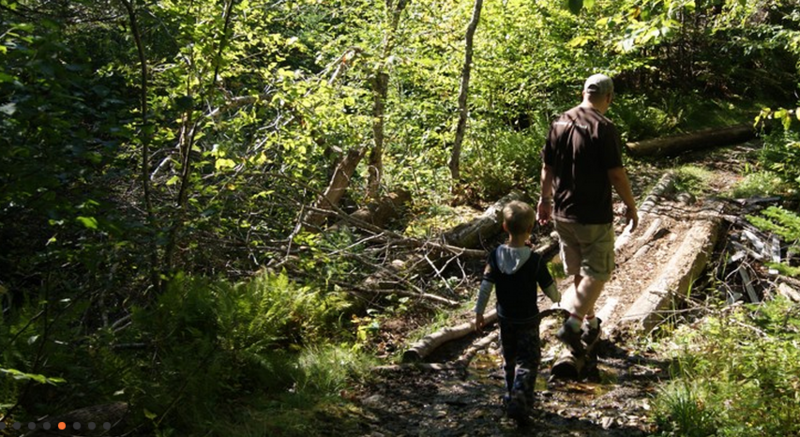 Cape Breton has so many trails for the whole family that are very easy to access! For people living in or close to Sydney the Baille Ard Trail has loops that range from a few hundred metres to 3 KM. All of them run partly along one of the two brooks. Parking is available in one of the two parking lots, one at the end of Terrace Street and the other off Cottage Road (The entrance is between 581 and 591 Cottage Road). If you are bringing along you dog make sure the dog in on a leash.